KIEV, Ukraine -- Both Klitschko brothers want to fight WBA heavyweight champion David Haye. Vitali Klitschko, WBC heavyweight boxing world champion speaks during a press conference in Kiev, Ukraine, Tuesday, March 23, 2010. "The biggest rival - or obstacle - in this fight is my brother," Vitali Klitschko said of Wladimir. "We cannot decide who will fight Haye. "I think we will have to flip a coin." Vitali said the brothers are "very angry" with Haye after the British fighter showed up at a news conference last year wearing a T-shirt depicting himself standing in a ring over the Ukrainian brothers' bodies, holding their dismembered heads in the air. "Haye is a man who does not choose his words," Vitali said. "He has always used bizarre ways to express his thoughts, whatever fight he performs in ... creating 'good' publicity." Haye, also a former world cruiserweight champion, will make the first defence of the WBA title against John Ruiz in Manchester, England, on April 3. He won the heavyweight crown from Russia's Nikolai Valuev in November in Germany. Haye says his goal is to unify the titles by beating the Klitschko brothers, who hold the WBC, IBF and WBO belts between them. 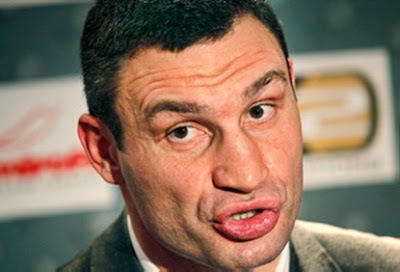 Klitschko will defend his WBC heavyweight title against Polish-born fighter Albert Sosnowski on May 29 in Germany. Wladimir retained his WBO and IBF heavyweight belt by knocking out against Eddie Chambers last Saturday. Vitali said his brother's next opponent is expected to be former Olympic champion Alexander Povetkin of Russia.